Ready for a hair makeover? 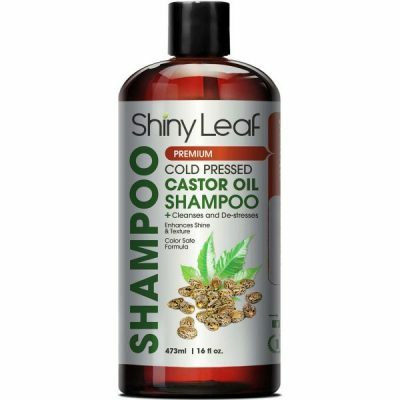 Shiny Leaf introduces Castor Oil Shampoo that packs powerful moisturizing and nourishing effects for silky and beautiful hair. One wash reveals shiny locks and a clean scalp that feels refreshing. With a color safe formula, hair color never loses its vibrancy. This special formula takes the benefits of castor oil on another level. It cleanses and helps the hair de-stress. Limp or frizzy hair gets to have improved texture and moisture. Even cleansing does not lessen the captivating shine of the tresses. Shiny Leaf Castor Oil Shampoo drive away dirt, oil, and toxins to reveal clean and fresh scalp. It strips off flakes and impurities that can clog the hair follicles and cause problems. The conditioner also replenishes the lost moisture to make it more manageable. Most of all, it promotes healthy hair growth by providing nourishment. Cold-pressed castor oil is famous for drastically improving hair – whether eyelashes, brows, or tresses with just regular use. With Ricinoleic acid, it provides enough moisture to last a day. Dry hair is a result of the evaporation of water content on the strands. 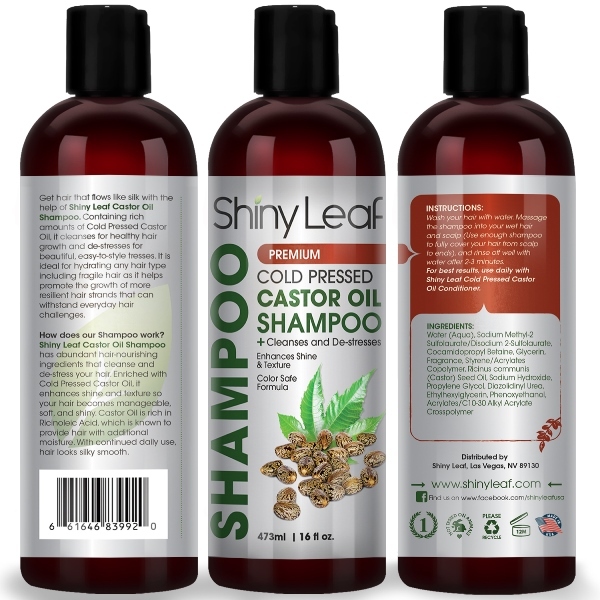 But due to the enhanced formula of Shiny Leaf shampoo, it traps the moisture to help the softness and hydration last for a whole day. Get great results with continued use. The formula protects hair from damages that everyday life poses. A lot of elements are harmful to the hair. The pollution, environment and even long exposure to the sun can cause damage. What helps is to use the gentle and cleansing formula of Shiny Leaf Castor Oil Shampoo. It even improves the silkiness for easy styling. Even handling the hair becomes easier and fun with this shampoo. 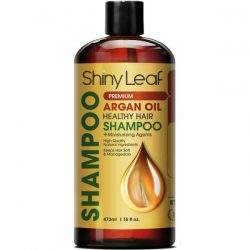 For best results, use with Shiny Leaf Castor Oil Conditioner. It does not simply nourish and protect. It redefines hair health with its effective benefits. Experience the magic with castor oil shampoo. Contains cold-pressed Castor Oil which provides an abundance of vitamins and essential fatty acids. Made to protect hair from split-ends and color fading. Helps with easy management and styling of hair. Cleanses gently to improve hair and scalp health. Destresses locks for smoother and silkier strands. Color-safe formula to protect hair from fading. Made with high-quality natural ingredients. Avoid direct contact with eyes. Rinse immediately with water once contact occurs. Wet hair and scalp. Pump a dime-sized amount on palms or enough formula to fully cover hair from roots to tips. Massage gently on the scalp to remove dirt, oil, and flakes. Rinse well with water after 2-3 minutes of application. Make sure not to leave any soapy residues. 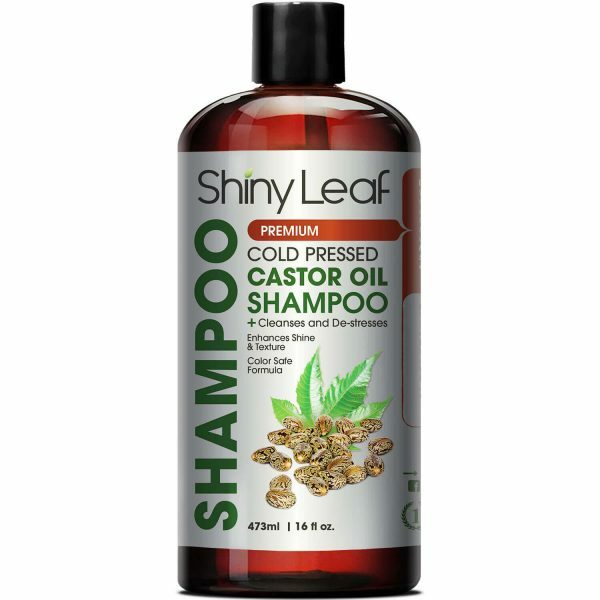 For best results, use daily with Shiny Leaf Castor Oil Conditioner.